What Are the Rules for the Ounce Sizes of Boxing Gloves? Boxing gloves come in a variety of sizes and are typically weighed in ounces. In both the amateur and professional ranks of the sport, general rules set the size of gloves each competitor must wear during competition. These rules require a fighter to wear gloves that correspond to his weight category. 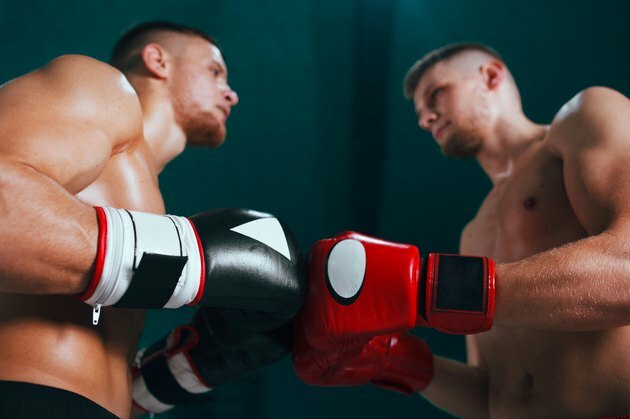 Amateur male fighters who compete in and between the middleweight and super-heavyweight divisions wear 12-ounce boxing gloves during their bouts. The most that a middleweight boxer is allowed to weigh when entering the ring is 165 pounds. However, the weight category ranges from 153 to 165 pounds. Therefore, the 12-ounce glove rule actually covers all boxers who weigh more than 152 pounds, which is the limit of the weight class below middleweight. Women use 10-ounce gloves regardless of weight class. Amateur boxers who fight in the welterweight division and lower use 10-ounce gloves. This rule also applies to boxers who weigh 152 pounds or less. The lowest weight class in men's amateur boxing is the light flyweight category, which has a limit of 106 pounds. The 10-ounce gloves are slightly lighter than 12-ounce gloves, and the inside padding is more compacted. As a boxer enters the professional ranks, the gloves he wears during competition decrease in size. Many amateur boxers have not yet reached the point of full physical maturity. Amateurs wear larger gloves as a precaution to prevent younger bodies from suffering trauma. In professional boxing, fighters in the heavier divisions compete in 10-ounce gloves. This rule generally applies for any boxer who weighs more than 147 pounds. Professional boxers who compete in any class up to and including the welterweight division wear 8-ounce gloves during a match. The lowest weight category in professional boxing is below 105 pounds, which is called mini-flyweight, straw weight or minimum weight. Fighters in these categories are usually much faster than their heavier counterparts. The smaller gloves allow a boxer to strike and respond with increased speed.